Highlights : Full day sightseeing tour of Delhi including visit to Qutab Minar, Humayun's Tomb, Parliament, President House, India Gate, Lotus Temple, Birla Temple, Red Fort, and Jama Masjid. Opportunity to see hundreds of birds including many migratory birds coming from European countries and Siberia at Sultanpur and Bharatpur National Park and Bird Sanctuary. See the historical and wonderful monument Taj Mahal at Agra. 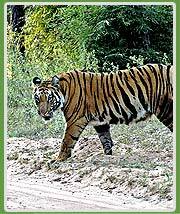 Game viewing and Tiger spotting at two of the famous National Park of Bandhavgarh and Kanha. Enjoy Elephant / Jeep safari. Enjoying Birding and Tiger spotting is one of the most favoured Eco activity that one can hone with their Eco vacation. Touring India and exploring some of its popular Birding and Tiger spotting locations is all set to give your holidays some precious memories to cherish forever. Our 12 day's tour packages will let you explore four of its famous National Park, Sultanpur National Park, Bharatpur National Park, Bandhavgarh National Park and Kanha National Park. Famous for excellent abode of several hundreds species of birds, and Tigers, these parks will enable you having a rich insight of Indian wildlife. Along with, you will be touring and exploring two of the most historically important city, Delhi and Agra. The meddle of visiting historical places and exploring wildlife will present you a neat portrayal of India. Our tour packages will include the cost of your fooding, lodging, and travelling. Hotels will be booked in advance according to what you have specified to us. As you arrive in Delhi on the 1st day of your tour, you will have enough of time to take a sightseeing tour of the city. The small tour will open up before you the visit to all of its important locations like Red Fort, Jama Masjid, Raj Ghat, Humayun's Tomb, India Gate, Laxmi Narayan Temple and Qutab Minar. After overnight stay at the hotel, booked in advance by us, you will set out early in the morning (2nd day), and will drive to Sultanpur (46 Km from Delhi) to see its famous Bird Sanctuary. You will be watching here hundreds of species of birds as it houses approx 250 species of birds. Purple Sunbird, Indian Roller, Spot billed Duck, Black headed Ibis, Little Egret, India Crested Lark, Rose ringed Parakeet, Red wattled Lapwing, Eurasian collared Dove, Red collared Dove, Laughing Dove, Rock Pigeon,Greater Coucal, Weaver Bird and Common Mynah are to name few of them. The day 3rd day will take you to watch one of the most wonderful monument of the world, Taj Mahal. Almost 3 hours drive from Delhi will lead you to Agra where you will be all stunned with the beauty of Taj Mahal. This superb emblem of love will leave you spellbound with its unique architectural beauty. In the evening , you will be driving to Bharatpur, believed to be one of the best bird sanctuaries of the world. En route you will halt at Fatehpur Sikri, and will explore the ruined city which was built by Mughal emperor Akbar. Bharatpur Bird Sanctuary, housing approx 300 species of birds, will busy you for the whole day (4th day) to discover the bird's heaven. The best thing you enjoy here will be boat ride in the lakes pervading here. Sitting on the boat and watching flocks of water birds swimming and taking a dip will appeal you to try your photography acumen. Early morning (on the 5th day) walk in the park will let you see some of the rare birds as well many of migratory birds from Europe, Siberia and Afghanishthan. After the Birding romance is over, you will drive back to Agra in order to take your way to Bandhavgarh. After overnight stay at the hotel at Agra, you will drive to Bandhavgarh, next morning (6th day). From 7th day to 11th day, you will be having abundance of wildlife view of two famous National Park of India, Bandhavgarh and Kanha National Park. The both park famous for its Tigers will make you avail the special Tiger spotting options making you see and film tigers in their natural habitat. Besides, the Elephant Safari and Jeep Safari will satiate your curiosity to enjoy Birding and see wild animals like Chital, Panther, Wild Boar, Wild Dog, bear, Sloth Bear, Deer, and Python. From Kanha National Park, the last spot of your visit to wildlife park, you will drive to Jabalpur in the morning of 12th day. You will take a drive form Jabalpur to Delhi where you will be transferred to Delhi International airport to catch your flight to your destination.